“Alex Ovechkin2” by Keith Allison. Licensed under Public Domain via Commons. I don’t know if we’ll ever see a power play quite like that of this decade’s Washington Capitals. We can’t attach a firm date to it because it could extend as far as the end of Alex Ovechkin’s career at this rate, but we know that its peak of power began with the hiring of Adam Oates as Caps head coach back in 2012. Oates had run a successful 1-3-1 power play for the New Jersey Devils with Ilya Kovalchuk as his trigger-man, but nothing even close to the heights he managed to achieve with the man advantage in his two seasons in DC. Barry Trotz, to his credit, has kept the same formation — what’s that old adage about things that ain’t broke? — with only minor tweaks, and last year the power play continued to succeed. 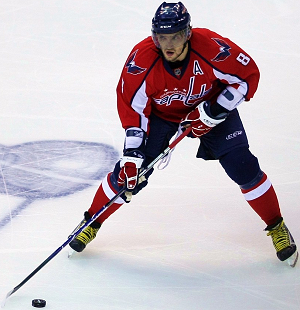 Now there’s a lot to discuss about the formation and its success — I like to think of the Caps’ PP as a work of art more than anything else — but for the sake of this post I’m going to focus in on Alex Ovechkin. Never has there been a more criticized future first-ballot Hall of Famer, nor arguably a more controversial elite goal scorer. It should already be a given that Ovechkin is the best power play goal scorer of all time — he sits fifth overall in PPG/g despite playing in a significantly lower scoring era than his contemporaries like Mike Bossy and Mario Lemieux — but I would argue by the time he retires, he will also likely be the greatest goal scorer of all time period. It’s the man advantage recently, in the latter stages of Ovechkin’s goal scoring peak, that has been the sniper’s bread and butter. Since Oates brought the 1-3-1 to town, Ovi has scored 48% of his goals on the power play, compared to 33% prior to that. He scored 25 power play goals last year, six ahead of the next highest total in Joe Pavelski’s 19. You have to go back another five to reach the player who is in third — Claude Giroux with 14 — indicating how great of a season the Sharks’ center/winger had, but that’s a story for another day.